On Sunday morning I was out birding across several Queens hotspots with my friend Seth. When I got home and found Daisy and Desi ready to enjoy the beautiful day I was pretty pleased that Desi decided on Edgemere Landfill, the capped landfill on the Rockaway Peninsula at the southeasternmost extremity of Queens, as his destination of choice. 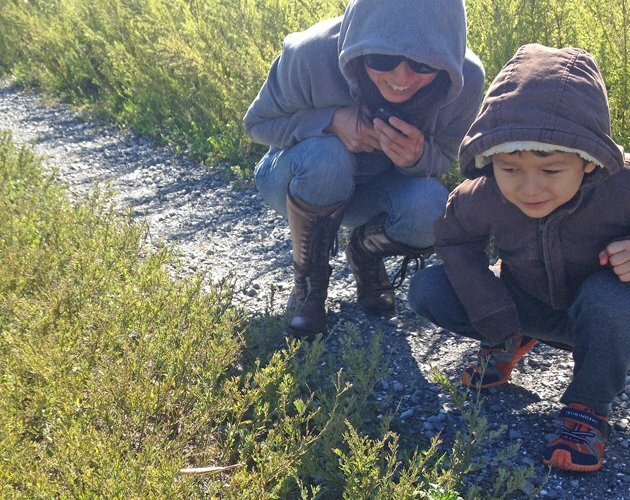 He’s a big fan of the grasshoppers and crickets that swarm over the landfill in autumn and he actually was talking about how he wanted to see birds too. Daisy agreed to the outing because it was sunny and nice and Edgemere, once mosquito season is over, is actually a really nice place for a family outing what with the long view of the New York City skyline and the refreshing air blowing off the bay. We had already enjoyed some American Kestrels and a couple of Osprey before we headed up the hill onto the top of the landfill on foot. Desi was having a grand ol’ time pretending to be the express train on one side of the gravel road while I was relegated to being the local train on the other. (That was still better than Daisy who was stuck being a service train.) We were enjoying the grasshoppers and crickets and laughing about when they jumped up and bounced off of us. Then, a discovery! Daisy has an amazing eye for bugs for some reason and she picked this mantis out after both Desi and I had walked right past it. 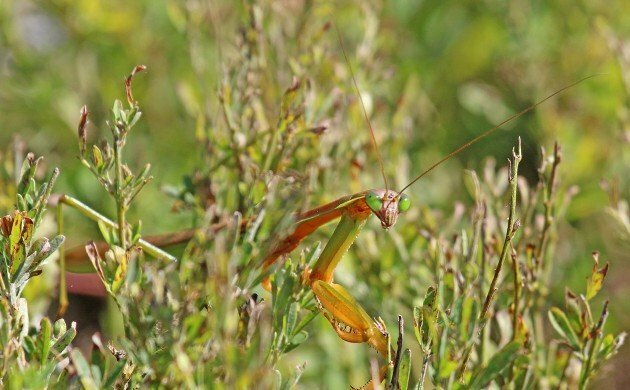 It was easily the biggest mantis I have ever seen. Desi was impressed. On we went, with me still on the local track and Desi zooming ahead. Then he stopped because something caught his eye. 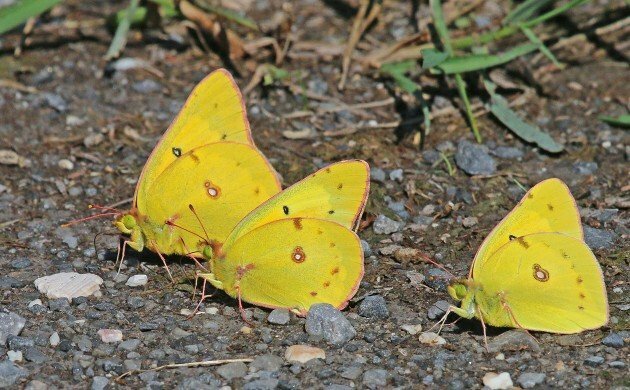 How can you not stop to pay attention to a trio of Orange Sulphers? After admiring the butterflies we continued our stroll, watching hordes of grasshoppers and crickets hop off the gravel road ahead of us. Then I saw a small gray bird fly from one wooden post to another about a hundred yards off the road. I put my binoculars to my eyes and said something that I should not have said in Desi’s presence. (Fortunately, he wasn’t paying attention, as is only to be expected with a four-year-old.) I muttered something to Daisy about being right back and headed off through the waist-high vegetation. 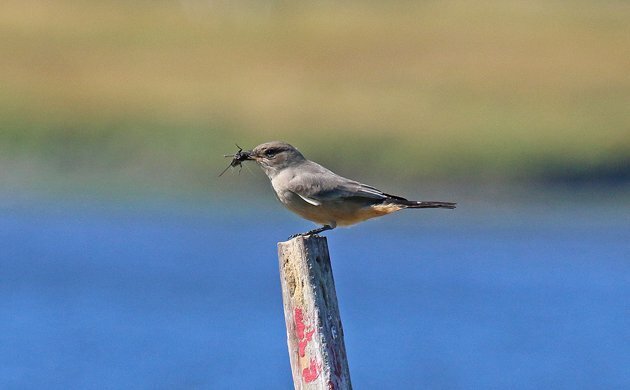 I had to get close enough to get a picture of what I was already sure was the first Say’s Phoebe ever seen in Queens! Somewhere in the back of my mind I heard Daisy ordering Desi not to follow me but she seemed to have the situation under control. And, yes, SAY’S PHOEBE! Note the beak full of cricket. It devoured that cricket and then moved from post to post, pausing to swoop into the thick greenery and grab a bug which it would bash and then eat. Awesome. So freakin’ awesome. I got back to the road and conveyed my excitement to Desi, who, after Daisy, was the third person to ever see a Say’s Phoebe in Queens. Then I got on my phone and got the word out to the listservs. We watched it for a bit before losing it when it flew over the east edge of the landfill. Not a great shot but it is the best flight shot I could get. Andrew Baksh was the first to arrive and, fortunately, shortly after he pulled up I spotted it not too far away. He got on the bird and stayed to babysit it while Desi and Daisy and I moved on to the important business of throwing rocks in the water, looking at more Ospreys, and, then, going to get some pizza. Not a bad bird for number 306 on the Queens list. And, at least as important, we got one back on Brooklyn! (bows down, Wayne’s World-style): We’re not worthy! We’re not worthy! Aw, shucks. I owe it all to Desi! 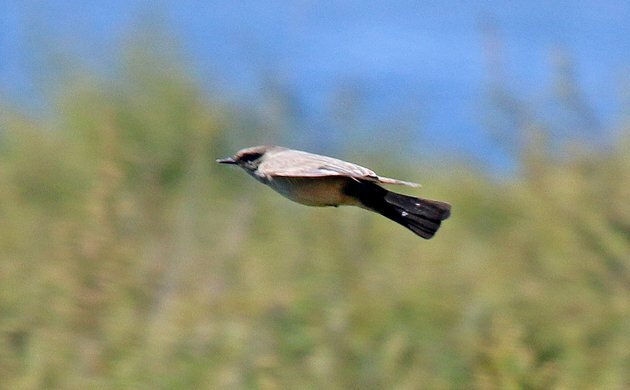 We saw a Say’s phoebe this afternoon in Bay Ridge, Brooklyn. Thought it was either a bluebird or robin, but beak color and breast color were not consistent with either a bluebird or robin. 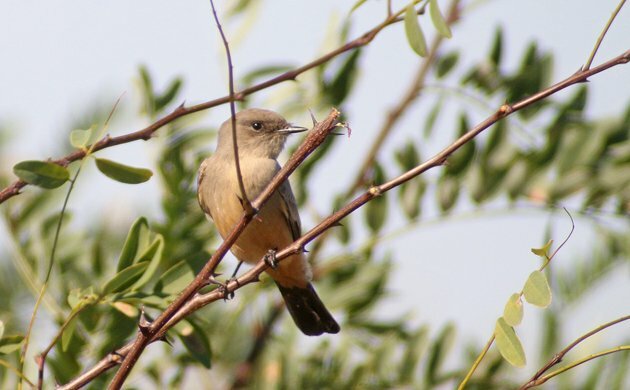 So, after looking it up in the Peterson First Guides – Birds, it looked most like a Say’s phoebe. Please get pictures – and fell free to email them to me at 10000birdsblogger@gmail.com. Such a sighting should be substantiated as they are very rare in New York.